Do you remember June, when lychees were bursting everywhere? The summer fruit sale offered pesticide-free lychees from Possum Trot Nursery and I loaded up. My friend Kattia, who grew up in Homestead and now lives in Sanford with her husband and son, was craving lychees since June, when I told her about the crazy season we had. Wasn’t able to drive up then with fresh lychees, so I filled my freezer. (Yes, you can freeze lychees, then peel and eat like mini popsicles. Kids love ’em.) With the start of the CSA season almost around the corner, it was time to unload my freezer and make a run north. Kattia loves to make jam. She had made me delicious mango jam a few summers ago. But what to do with thawed lychees? 1. Combine lychees, juice, and sugar in a large bowl. 2. Add freezer pectin, and stir for 3 minutes. 3. Fill plastic freezer jars. Allow mixture to sit for 30 minutes. It’s ready to use! 4. Keep jam in refrigerator for 3 weeks, or store in freezer for up to 1 year. 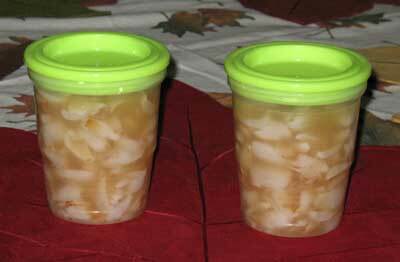 Got the freezer pectin and freezer jars at the Sanford Wal-Mart. (That’s where I stumbled across the Redland Best avo’s a few aisles over.) The recipe was very easy. You could even make this with your kids. A grownup would have to pit the fruit, as a sharp knife is required. The chunks of lychee were a bit big in this batch. Next time I’d run the fruit through a food processor to make the pieces smaller and more spreadable. Thawed lychee doesn’t mash very easily. Don’t know enough about canning to suggest an alternate to sugar. Wonder if agave would work as well.